There are quite a few "make alongs" happening at the moment and I'm planning a bit of double (and even triple) dipping so I can take part in a few. 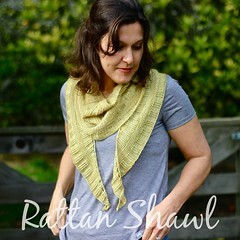 I'm hosting the Spoil Yourself "stitch along" this month on Ravelry (you're welcome to join in if you're not already! ), Helen is hosting a three month long Handmade Wardrobe Challenge in the Curious Handmade Ravelry group and I'm also taking part in the 1 Year 1 Outift challenge to make an outfit with local materials run by Nicki from This Is Moonlight. Are you joining in any of these challenges? My big contribution to the "alongs" is my Gingerbread Sweater. I've been beavering away on it for a while now and look! I'm almost done! Everything has been knitted and blocked - I'm just waiting for those sleeves to dry so I can seam them in! I can't quite believe I've made it this far. The pattern is getting done too - the bones of it are written. It just needs tidying up and grading. Gingerbread will be my first published sweater. It's been quite a nervous adventure. 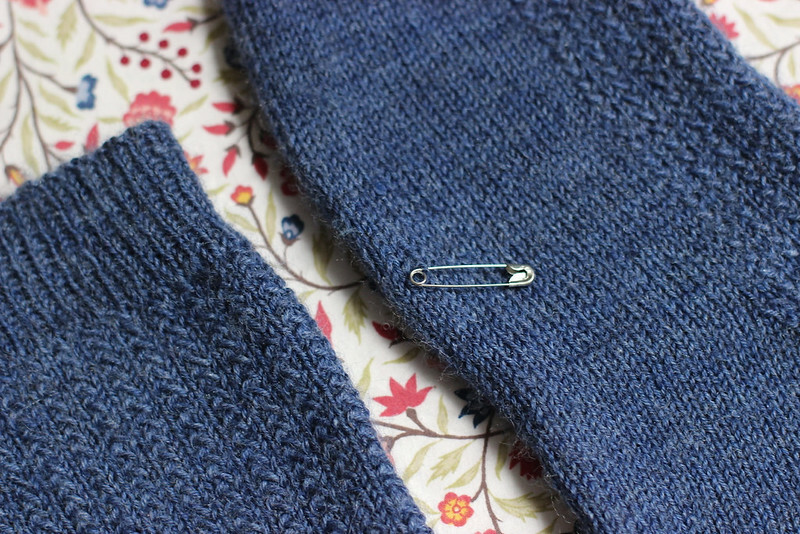 Despite having designed and knitted a number of garments before, I have been feeling quite wobbly about doing it for real and releasing it to the public. It's a medium length, boxy sweater with a casual, comfy fullness to the body and slim arms. I went for set in sleeves in the end because I wanted structure at the shoulders to help it fit and fall well. 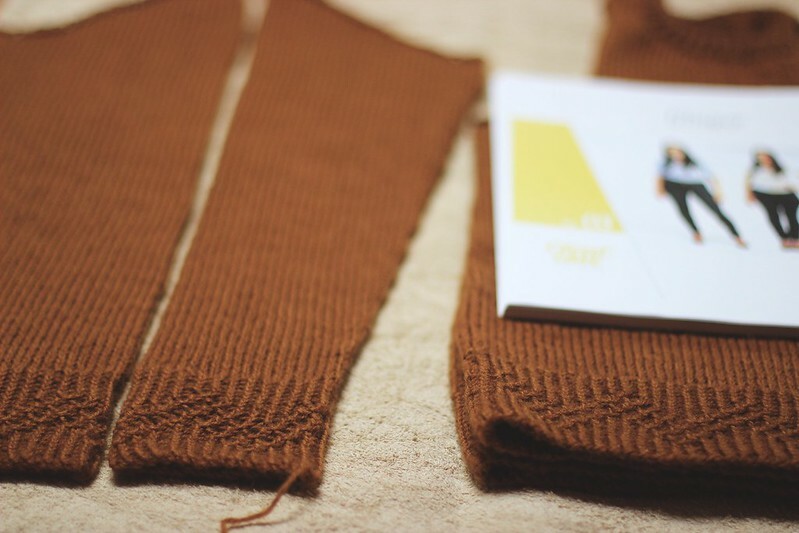 It's knitted bottom up starting with the lace ribbing and the both the body and the sleeves are knitted in the round to the armholes. 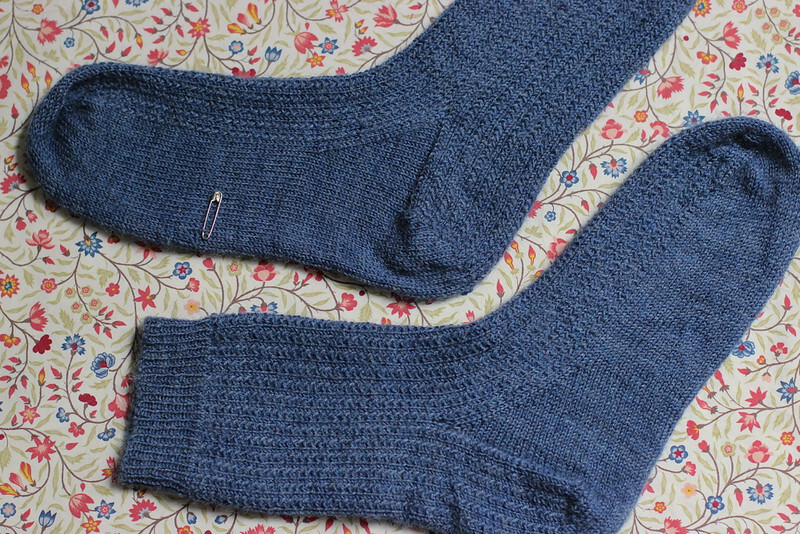 The sleeve caps and top of the body are knitted flat and then the shoulders are joined with a three needle bind off so the only seaming is the sleeves right at the end. I'm really pleased with the neckband, it's a lovely curve, finished with a narrow band of twisted rib with a rolled top - it's not tricky and ever so effective. The various "alongs" have motivated me to swallow my nerves and get it finished! 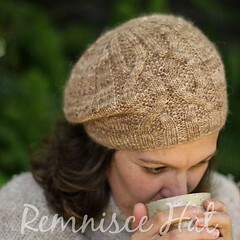 I've loved knitting with the local Romney yarn from Rosewood Wool. It's a coarser yarn than a slinky merino but I love that it feels so rustic. It blooms and softens nicely with blocking and I can see that it's going to just get better and better - both softer and more relaxed without pilling. I think it's a great combination with the style and idea of my Gingerbread sweater - a casual, comfy sweater that you'll reach for day after day after day. But an outfit isn't just one sweater is it? I've decided to team my Gingerbread sweater with some new jeans. I rather fancy some dark denim jeans and thought I'd have a bash at sewing some. 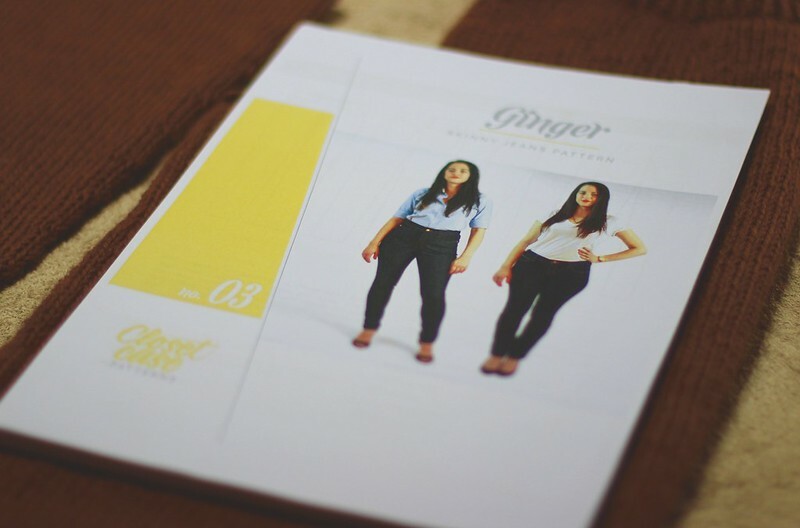 Oh my - I've just noticed the name of the pattern I've chosen - the Ginger jeans ... haha! Obviously it was meant to be! I haven't tried sewing jeans before but I've heard great reports about this pattern and I'm ready to have a go. I'm not sure which style to try - I'm thinking I'll probably do the medium rise style on the right. I haven't worn high-waisted jeans for many decades - I'm not sure I'm ready to get back into them just yet! I'll also need a top to wear under my sweater - I might wear one I've just finished or perhaps take the opportunity to make another so I'm prepared for next winter ... we'll see. It goes on and on doesn't it?! Are you joining in any of the challenges and "alongs" I've mentioned? What are you making? Do tell me! You're invited to join the great Truly Myrtle July KAL starting 1 July in the Truly Myrtle Ravelry group! 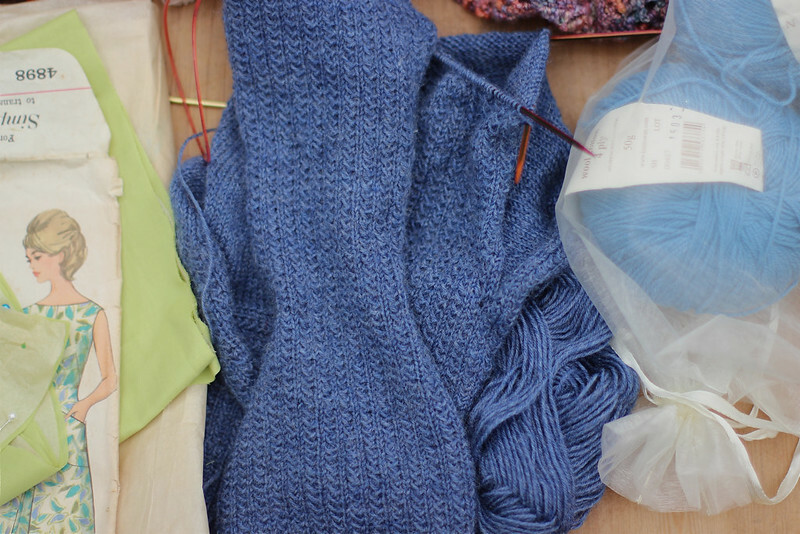 There are nearly 600 of us in the Truly Myrtle group now and I thought it would be nice to do something all together so we're having a great big knit along - we're choosing any Truly Myrtle pattern and knitting together throughout the month of July. 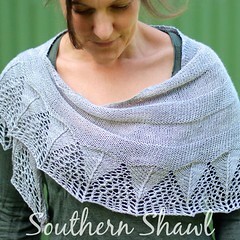 There are six shawls and two hats in the Truly Myrtle collection. 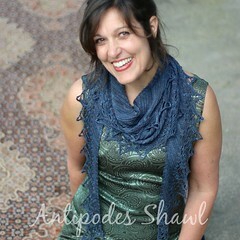 Are you in a shawl phase? 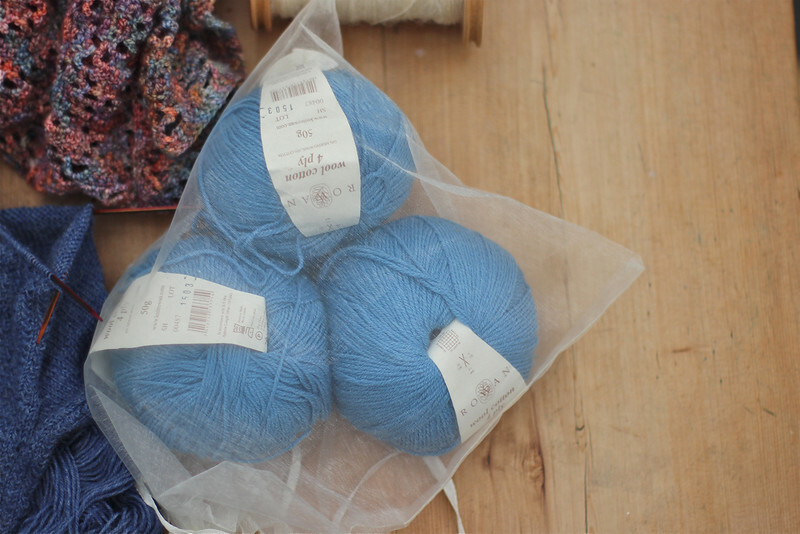 Keen to knit your first shawl or does your wardrobe need a cosy hat? 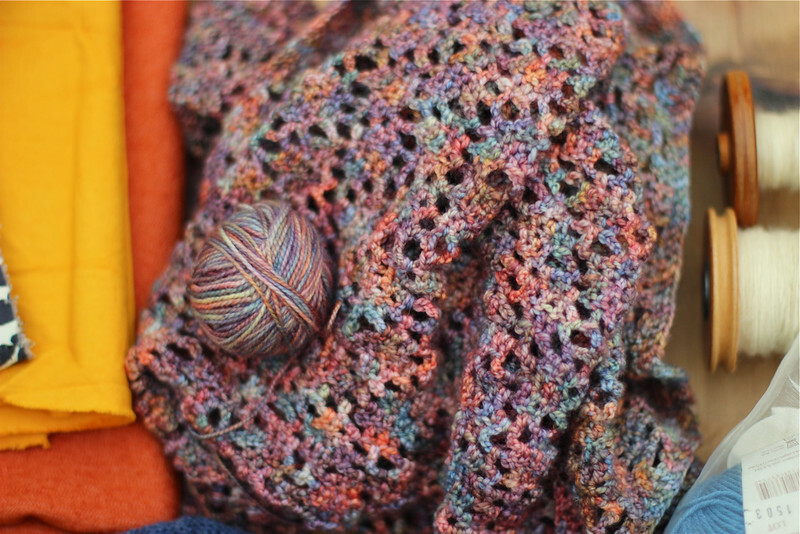 See what tickles your fancy and find some beautiful yarn to match. We're going to cheer each other along, help each other with questions and generally have a lovely time. Knit as many patterns as you like! I'm not too bad at juggling a couple of projects, but six? Nope. Too many. Especially with all the kids home for six weeks of summer holidays. I've got to finish a couple of things, and quick. Let me tell you where I'm at. 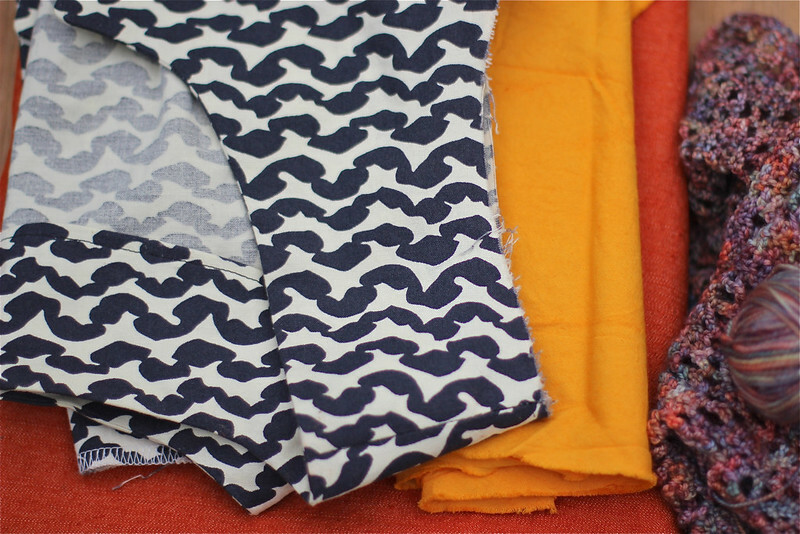 A while ago I started a sleeveless Washi top in black & white fabric, but it was put to one side when it seemed summer would never start. After enjoying my recent sewing I pulled it out again and resolved to finish it and put it together with something from my stash for a second bonus outfit (I've also resolved that all "bonus outfits" can be made only from fabric and yarn in my stash). The snag is that I can't seem to find the rest of the black & white fabric to make binding for the sleeves ... goodness knows where it's gone. So instead, I've decided to make bias binding from the pumpkin coloured cotton in the picture. It was originally cream but I dyed it, along with the burnt orange denim underneath. Do you recognise the denim? It's the remainder of the fabric I used for my trousers in outfit 2. I'm rather in love with the rich shade it's turned with this recent dye job. My plan is to make a short denim skirt to go with my top. Initially, I thought I'd use a pattern for my skirt - I've had my eye on the Moss Mini skirt from Grainline Studio, but I'm toying with the idea of copying a pattern from a skirt I've already got. So, there's a bonus outfit to finish. The top should be quick, but the skirt ... hmmm. 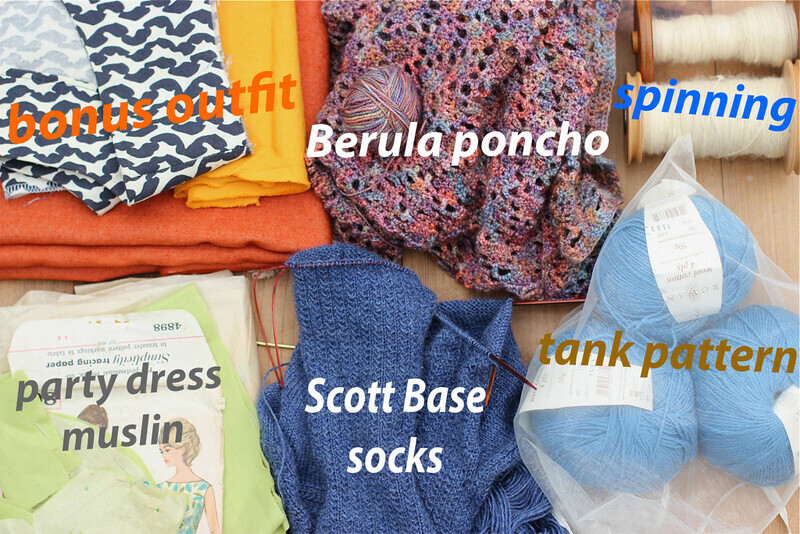 I am desperate to get my poncho for outfit 6 done. It was great learning how to do the crochet stitches and follow the pattern, but now I'm more than ready to block it, sew it up and not crochet another stitch of it. Look how small my ball of yarn is. Really, I should just sit down and crochet until it's done. 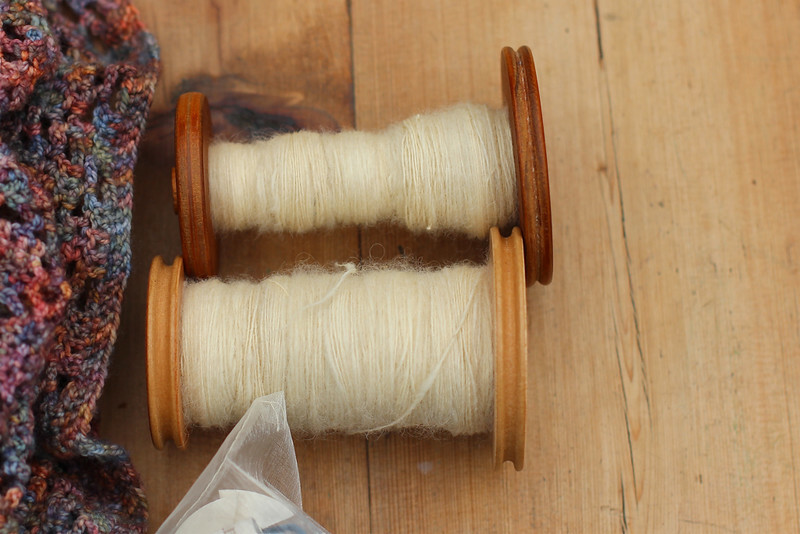 I'm loving spinning the bluefaced Leicester and it's going pretty quickly. But, I'm planning to buy more fibre this weekend and would rather like it off my wheel pronto so I can get the luscious new stuff on. There's a part of me that's regretting taking this project on. It's my party dress for outfit 6 and I'm using an old pattern that comes in only one size and it's much too big for me. 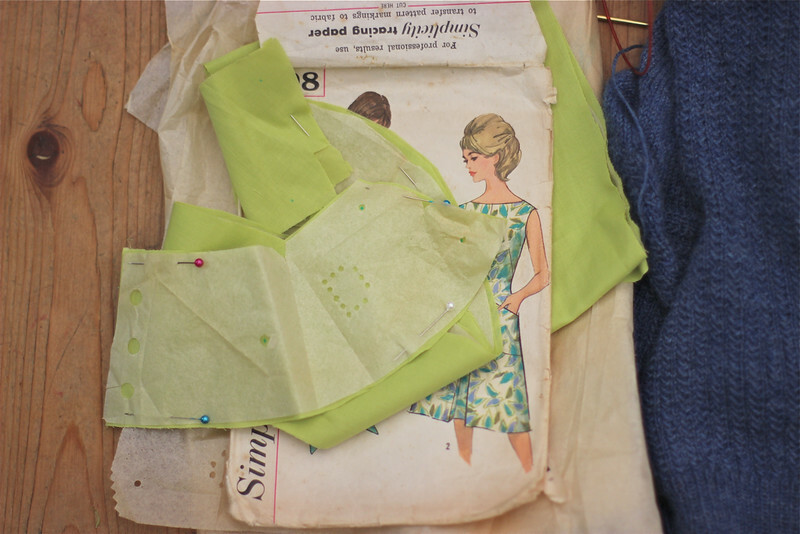 I started by cutting out a muslin in my trusty lime cotton and basting it together to get a feel for how big the dress would be. I thought I'd adjust the muslin, transfer my changes to the pattern and all would be good. Oh, how wrong I was! Basically, the muslin is massive. There's just too much to change and aside from the fact I've not done something like this before, it's super hard making those sorts of adjustments on yourself. Mr Myrtle and the kids wouldn't be much help in that department and I haven't got a sewing dummy. So, my new plan is to alter the paper pattern, then make another muslin and then fitting that. Sound doable? I'm crossing my fingers I'll be fine, when I muster the enthusiasm to tackle it. Mr Myrtle's new socks are coming along nicely. 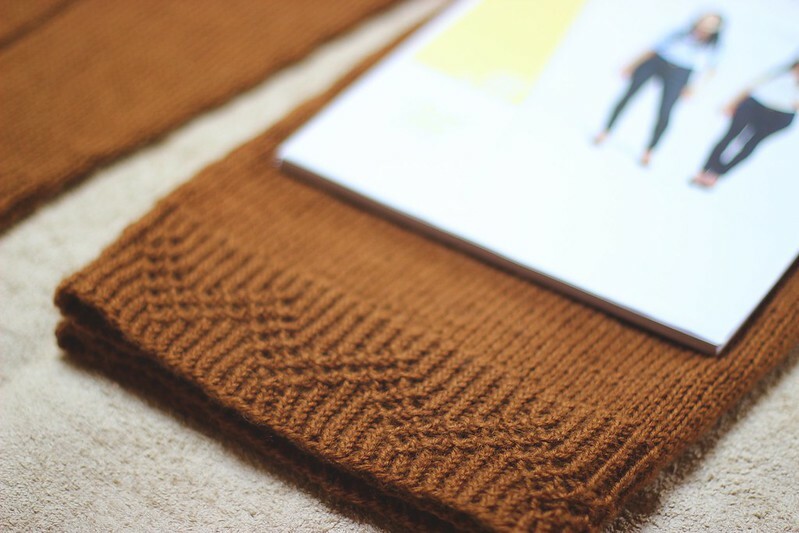 They're a perfect project to take places, great for "chatting knitting" and they're looking great. I'm nearly at the toe on one and about halfway down the foot on the other. Soooo close and I'm tempted to get these off the needles first because I'm enjoying knitting them. And finally, something that's making my brain buzz. I've started writing up and grading my tank pattern. 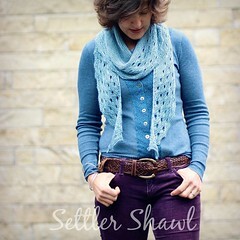 I'm including some changes to the design and am going to knit up another in this lovely blue yarn. If I'm honest, this is all I really want to do. All the time. I am absolutely loving figuring it out and I'm learning so much. But, I can't do it all the time, especially during the school holidays! I expect it will be done in fits and starts and probably be ready to release just in time for winter! 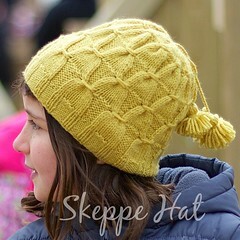 Remember, I released a winter hat just in time for spring? Hopeless!